I had been waiting for this book for ages, not only because I thoroughly enjoy the series generally and there had been a big gap between new books, but also because this book is set in Colonial Australia, with dragons! It has been out for a while now and I am finally getting around to reading it. I am not very far into the book, and the jury is out so far as to what I think of it so far at least. He felt himself caught between shoals and a lee-shore, in an unfamiliar channel: MacArthur's machinations were no more noble than Bligh's in their ends, and likely less; even if in their forthrightness more appealing, and with the benefit of MacArthur's greater charm of person. And they were neither of them looking beyond the parochial boundaries of their quarrel, to the titanic struggle creeping ever more widely over the world. If either of them gave a thought to the war, Laurence could not discover it, and though they might gladly make him any promises which would make of him the useful ally they desired, they neither of them recognized in any real way the colossal folly of wasting Temeraire in this isolate part of the world. The fascinating thing about these books is that the author takes actual history, and gives it enough of a tweak to include dragons. Both William Bligh (yes, of the mutiny on the Bounty fame) and MacArthur are famous names from Australian colonial history. Teaser Tuesday is hosted by Miz B at Should Be Reading. Head on over to find out all about it, and how to join in! An intriguing premise, but just that little bit of the language had my head spinning (though that could be due to the late hour, lol). I hope you enjoy the rest of the book! I have to agree with the previous poster, the language was head spinning! Here is my teaser from The Doctor's Sweetheart by L.M. Montgomery. Wow, I agree with the others, I like the idea of dragons so might have to check it out. Happy Reading. A colon and a semicolon in the same sentence? I didn't even realize it was possible. I think this one is a bit beyond me. Apparently I may have picked a bad teaser! The language definitely has a nautical feel to it - think a cross between nautical fiction/historical fiction/dragons. They are actually a lot of fun. I have never heard of this book or the series of books. Thanks for visiting My Reading Corner. I do like it when actual historical events and people are used as the based for fiction - I'd never considered that combo though. Look forward to hearing whether the author manages to pull it off. My teaser this week comes from a Phryne Fisher Mystery, Queen of the Flowers – full of fun, mischief and whimsy! Love this series to bits. Only read 2 so far but the others, or some of them, are sitting comfortingly on my shelf waiting for Carl's fantasy challenge. :-) I liked the sentence you chose. I love, love, LOVE Naomi Novik. Great choice of novel, great teaser. Here's my teaser for this week. I'm a recent convert to the least bit of fantasy in fiction reading. That happened with the time travel in Outlander series. Also got me interested in historical fiction. When I tire of current time period (1700-1800s) may have to check out your dragons. Thanks for stopping by my link. Excited to know that you loved the latter Donati Wilderness books better that first ones. Good times ahead! I love the setup of this -- based on fact and real places yet a different world.And I love the cover! I'm trying to think of the word to describe the language in this one: definitely full and broad, and telling us a lot about the narrator's frame of mind. My daughter is just nuts over dragons, but I think this series might be a little mature for her. That's ok though, as I can just add these to the list and see about them for the future. Come to think of it, my mother loves dragons as well, and this might be a perfect fit for her. Thanks for sharing this with us! Great teaser, just not sure this is a book I would pick up. Loved that teaser! Sounds good to me. I've read a few books that did similar things with real history and fantasy and really had fun reading them. Great teaser. Forget-Her-Nots by Amy Brecount White which is on sale right not for only 5.19 on Amazon for new hardback!!!! I figure I should spread the word since it is such a popular YA book and the author is so nice. I have the link up if you want to check it out! Colonia Australia with dragons!! That sounds absolutely fabulous! I'll be looking forward to your thoughts on this book. 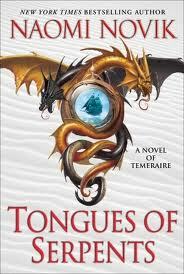 I absolutely love this series: Laurence and Temeraire rock! I've been saving the fifth one until now, because feeling as though I had only the immediate book was kinda sad; I'm looking forward to getting a copy of this sixth one, and then treating myself to reading the one I've been hanging onto all this time. Maybe I'll even re-read the other four first! I'm a fan of this series as well; I agree that the book isn't as hard to read as that snippet suggests; that's written when he's stewing around in frustration because he can't do anything, but when they start getting out the sentences are a bit crisper. But then semicolons don't intimidate me any more than periods do, so there! Beth, I must have picked a bad passage! Oh well. Can't have great teasers every Tuesday! Buried in Print, I hope you do get to enjoy this first. I am not a big rereader so I do have respect for those people who can reread whole series every time a new book comes out in a series. Tiina, the series starts out with Napoleonic war and dragons. So much fun! Leya, you are welcome! Start with the first book which is published either under the title His Majesty's Dragon or Temeraire. Zibilee, it might be a bit hard at this stage, because the language is quite formal - reflective of the time it is set in. Booklover, I think the author is successful with it in the earlier books. Thank you to everyone for visiting my Teaser Tuesday post this week. TSS: Top 10 reads of 2010... and some stats!